Bellsouth hope to have a pre-publication copy for perusal at the Canberra National in June. I have included a couple of randomly selected page to give you all some idea of the balance of the content. If interested Bellsouth will be taking book orders at the show, for the more budget conscious we are working on an e-book. Last edited by blackdotte on Wed Jun 25, 2008 5:35 pm, edited 1 time in total. oooh good... pictures!!! I can understand pictures...when its words without pictures and I don't have anything to relate to then it gets hard. What a brilliant idea. It is the first book to use colour photographs to amplify every point. It was written in a way, that it could be understood by every age group,& without any prior knowledge. Now something I want to know- do we have any Dutch speaking members? Might just have a nice surprise in store! Chicken colours compared to tomato vegetable soup, that comparison fits! Isn’t the word ‘genetics’ horrifying enough to shout ‘that is not my piece of cake!’? Or even worse, why would you be interested in colour genetics anyway? A chicken is a chicken and its colour is always there. For those who think thats enough to know, this book is worthless so skip this page. For the ones that want to know how the chicken got that colour, this book is great! There have not been many books about chicken colour genetics lately, although most books are written in English. The books that are written are mostly old,20 years or more, or just dull , not comprehended by the average breeder, due to the scientific way they have been written and,being without colour photographs not appetizing at all. Books about colour genetics have never been illustrated as richly this book for dummies! Because we are dummies we need all those photographs to understand, because we are not professors nor mathematicians. Therefore I wrote/made this book because we aren’t scientists, we are fanciers and exhibition breeders! This book is made by a dummy who stirred and cooked all the hard to understand knowledge until it became a tasteful and digestible meal for anybody with an education (13 years up). How can a ‘dummy’ do this? Simple, by asking no high demands to own thinking and understanding, taking all the time needed to comprehend, and ask others who do understand the genetics if something isn’t totally clear. All colour genes are divided into 4 groups. Every group is explained in 1/3 text and 2/3 photographs because a picture tells more than a thousand words. It starts with the explanation of certain words you just have to know, that’s the toughest part and consists of less than 5 pages. The book is bursting with new things because science didn’t wait for this book the last 20 years. The action of the genes is explained and you don’t have to learn anything because its very logical. It is so much more logical that you can’t understand why this book like this has never been written before, and why genetics were always was covered with a vail of mystery. Well, that era is over now, anybody can understand the colour genes after reading and looking at the pictures in this book. Why write a book about something you work with every day as a breeder, and why has a book like this never been written ? Because its very interesting. You can really improve your breeding, you don’t have to gamble and guess as much anymore. No or less miscoloured chickens , and you save lots of money on feed and lives of chicks that are not the right colour. You can now take a good typed bird with another colour and cross it into your line for vigor, fertility or whatever your goal is and because you know what you are doing, in a few years you have the desired trait and the colour is restored. Don’t cry ‘there are creepy symbols in this book!’, just read it and you will find out they are only shortcuts for longer words and... they are internationally recognized so you can ‘talk’ to anybody in the world about genes when you know these shortcuts. For English breeders the shortcuts are logical, because most genes have English names! Breeders from other countries find it a bit more difficult but every shortcut is repeated over and over again together with the ‘long name’, so you don’t have to learn them by heart. You just recognize them in a playful way. The book is written loosely, no ‘scientific’ jargon, it reads as if somebody is telling you the story of chicken colours, not dull at all, you won’t fall asleep as you did when you read the old books. Attention is retained because you have eyes to look at the beautiful photographs that tell you about the genes. For the ones who can’t remember anything, there are several schemes in which you can look up the name of the gene and its actions. The photographs are not standard pictures, but photos of ‘real’ animals, mostly at exhibitions but also at breeders’ homesteads in their pens and coops. You will see so many new things in chickens if you know what to pay attention to, you can be a colour-judge after reading this book and you know why colours look the way they do. Next to easy text, beautiful photographs the page design is vivid and playful too, as if every page is a piece of art, therefore this book is a little party. Its a book for breeders who want to look at photos instead of studying and learning text. The second part of the book is the ‘recipe book’, in which most Standard colour varieties are explained. The book is originally Dutch, so there are lots of Continental European colours but the English/US colours and others are included too and where a photograph was available, its in there as well. In the recipe book there are also some new true breeding colours that are being created all the time by imaginative breeders who like to play with the colour genes. You can,if you wish, be one of them and create your own colours. Anybody who thinks or says ‘colour genetics, thats not for me’, will agree after reading this book that it is not a mystery at all and anybody can understand it! The book consists of 224 pages, has over 600 photographs, all are in full colour of course. Therefore the book isn’t going to be‘cheap’, because there are high demands for the printing process and colour printing is, of course, much more expensive than black & white printing. 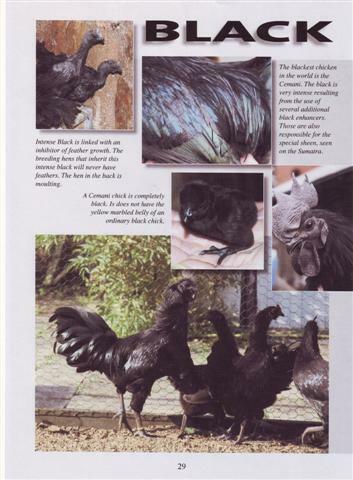 The knowledge in the book is updated to 2008 and therefore contains information from the newest scientific literature that is beneficial to breeders of hobby chickens. The English book will be more up to date than the original Dutch version because we collected some more new and interesting facts. This book will be your colour bible in breeding. You can look up everything when you forget something, or look at the photographs if you looking for something specific. You can discuss things clearly, don’t have to guess anymore and the Dutch breeders who have this book already are very happy with it. The hobby has got a completely new dimension the past year.Several groups of Dutch breeders have come together at forums and everybody is discussing what they finding in their pens. Even colour experiments are being done and everybody is able to understand each other. Together with the chicken colour calculator breeding is more fun than ever! In addition, old colours/breeds can be restored with this knowledge, and new colours will be created! This book is the first genetics book ever made with so many photos, easy reading style ,and for the first time in history written by chicken fanciers. Everything is based on scientific facts and therefore you can rely on it in your breeding until new perspectives are discovered by science. Genetics of Chicken Colours for Dummies will be available in a real print book (easiest to read) and also as a secured (very copy protected) eBook. can i have one signed by you and sigi. i am not into first editions and signed copies usually as they mean nothing to me as i am just hungry for what they say. however in this case i feel it is special. the book will not stay mint. it will be read and reread. it will lie on the floor beside all the other books next to my chair where i can grab it when ever i need it. i know to do this the book will need to travel to or from holland and back again but that is fair enough. The how and why of chicken genetics has long been a mystery to many of us amateur chicken breeders and books on the genetics of chicken colours are few and far between. 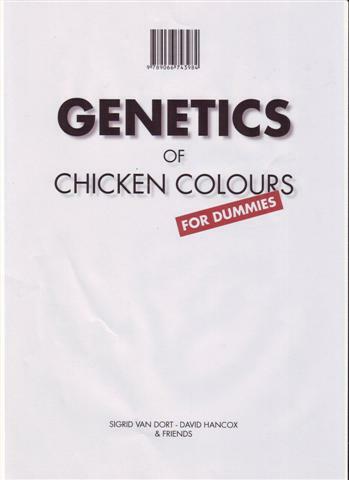 The book 'The Genetics of Chicken Colours for Dummies' is therefore a very welcome addition to this field. The book reviewed was written in Dutch in 2007 and the English Edition is expected to be published as e-book and in hardback format, and possibly soft cover, in Australia the middle of this year. The book is written by Dutch amateur geneticist and chicken breeder Sigrid van Dort with the help of her friends and is intended for amateur chicken breeders who lack a formal background in genetics. Sigrid's co-author of the English Edition is Australian David Hancox. David's contribution is based on knowledge gained throughout his 45 years of experience in the field of chicken breeding. Bellsouth will be responsible for the launch of the English edition of the book. One of the first things one notices about the book is the large number of photo illustrations. The author's claim that the book consists of about 2/3 illustrations and 1/3 text appears correct. The numerous illustrations of both birds and individual feathers make it easy to identify the more subtle differences in colours for example; different types of barring may look similar when seen on a bird but are quite different when individual feathers are compared. The second aspect that stands out is the 'down to earth' style in which the book is written. The author introduces genetics by comparing chicken colours to vegetable or minestrone soup and uses this example throughout the book to highlight how genetics work. For example, similar to soup, the colour and appearance of chickens can be the result of a greater of lesser concentration of say tomato paste, while at other times a colour can be the result of a adding a completely new ingredient. By comparing the daunting topic of chicken genetics to an everyday item such as soup the author demystifies the topic and makes it, excuse the pun, easy to digest. The book explains in simple terms how genetics create certain colours and the factors that influence the way colours are inherited. The author also discusses how different genetic factors combine to create colours and provides numerous examples of the results of particular crosses. The book includes special sections on topics such as: the red colour of the Yokohama breed, feather patterns, and has exercises for readers to test their understanding of chicken genetics. 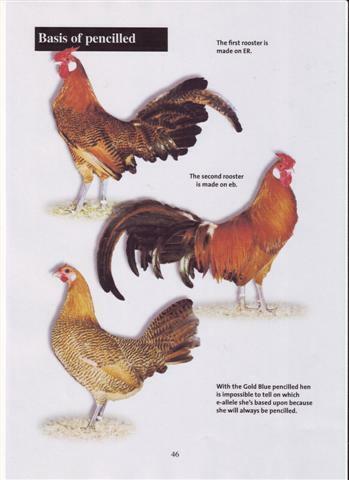 About a quarter of the book's more than 200 pages describe in words and through photos of both hens and roosters the wide range of standardised colours and the genetic 'recipes' that are responsible for their occurrence. In light of the easy to read style and the ability of the author to explain complex material in an easy to understand manner I hope she will also expand or write a further book on chicken genetics covering aspect such as crests, beards and leg feathering and the differences hat can be found in Frizzles and Silkies. I expect that this book will be well received by Australia's amateur chicken breeders and fanciers, and commend the author on presenting the topic in such an easy to understand manner. About the reviewer, Erik Berrevoets has bred and kept chickens off and on for the last 30 years and his knowledge of genetics prior to reading the book did not exceed that of a year 12 biology student. I think we will have a Hardback,cost will depend on run number,& where it's printed,but be warned I don't think it will be cheap. A Soft back,cheaper and an E-book,the cheapest but not always the most preferred option. If anybody would like to give a non binding indication of what they would like ,then please PM me. www.chickencolours.com is now up but not fully completed,have a look anyway. I would be interested in a hard cover copy when it is released. why the threats..I thought the name was perfect.. I suspect the "For Dummies" part has copyright protection due to the series of computer books....Windows for Dummies....etc, etc. It crossed my mind when i first saw the title of this book, but i'm only surmising.